In 2018, Langley City council budgeted to invest $1.59 million into our library branch in 2018, and plans to invest $1.68 million this year. While libraries are still a great place to get access to books and other resources, they also provide other valuable services to our community. Langley City’s library branch is a safe place for all people in our community to visit, learn, or participate in events. It is one of the few indoor spaces in our community that is accessible to any person who is respectful of others. Langley City is a member of the Fraser Valley Regional Library system which is one of the largest library systems in Canada. This gives Langley City residents access to 881,000 items to borrow as well as access to programs and other services that wouldn’t be possible if Langley City went it alone. The Langley City branch was open 67 hours per week (excluding holidays) in 2018 which is longer than any other branch in the FVRL system. 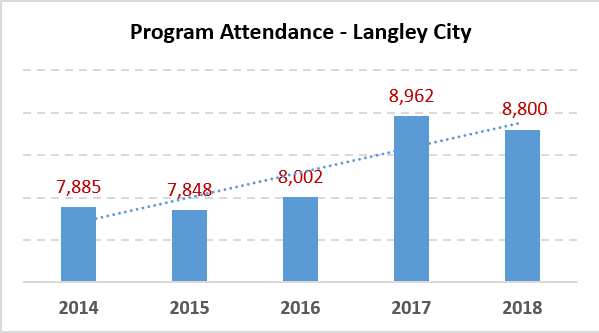 In 2018, 382 programs where offered at the Langley City branch with over 8,800 people attending. That number represents around a third of Langley City’s population. As shown in the following graph, the number of people taking part in these programs has been increasing year-over-year. Program Attendance - Langley City Library Branch from 2014 to 2018. Select chart to enlarge. A quick search of the FVRL website yields a large selection of events in our branch. This is in addition to other programs and resources such as tools to create music and videos, to help learn how to program, to become an amateur astronomer, and to experience virtual reality. Other services include booking time with a librarian to help people navigate technology and help with research. Another important service that is provided is access to computers and the Internet. There are 23 public computers at the Langley City branch with an average of 70 to 80 logons per day. There is also free WiFi access for card holders. Around 52% of Langley City residents were active card holders in 2018. System wide, FVRL has seen the number of active card holders increase from 34.4% in 2014 to 42.7% in 2018. Libraries are still a place that people use to access books, audiobooks, DVDs, and CDs. It’s no surprise that circulation of physical audiobooks, DVDs, and CDs has been declining. 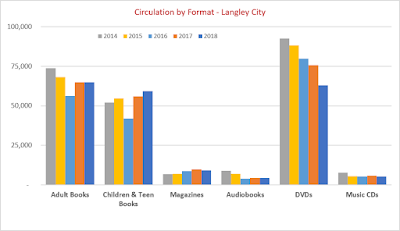 What is interesting is that while adult physical book circulation appears to have stabilized, the circulation of children & teen books, plus magazines has actually increased in Langley City. While the FVRL does not provide “by location” stats for e-books and other e-material, those e-materials have increased in circulation by 29% over the last five years. 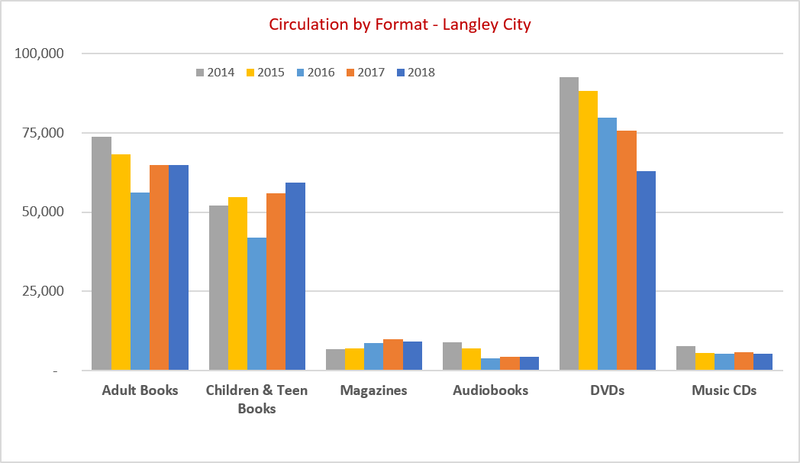 Circulation by Format - Langley City Library Branch from 2014 to 2018. Select chart to enlarge. Langley City’s library branch continues to be an important part of our community with more and more people taking advantage of the many services offered. Libraries are a place for continual learning, not just a place to check out books. As a note, the Langley City branch was renovated in 2016.